HungIn the land of yuletide cravings, happiness is a warm sugar cookie. Bring joy to your holiday kitchen with this recipe for the merriest sugar cookies of the season. Beat 1 cup sugar and the butter with an electric mixer until creamy, then add egg and vanilla (beating for 30 seconds) before adding flour (beating at low speed until combined). Put the dough on a lightly-floured piece of parchment paper, and roll to 1/4-inch thickness. Place the roll on a baking sheet and freeze for 10 minutes. Preheat the oven to 375°. Cutting the dough with lightly floured 2-inch cutters, place slices 1/2 inch apart on two lined baking sheets. Roll the scraps and repeat process. Bake each sheet at 375° for 8 to 10 minutes, then cool on a wire rack (about 30 minutes). Whisk together frosting ingredients until you have a thick mixture. Once satisfied with the thickness of the frosting, add to cookies and transfer to a wire rack. Decorate as desired before letting them stand for an hour. 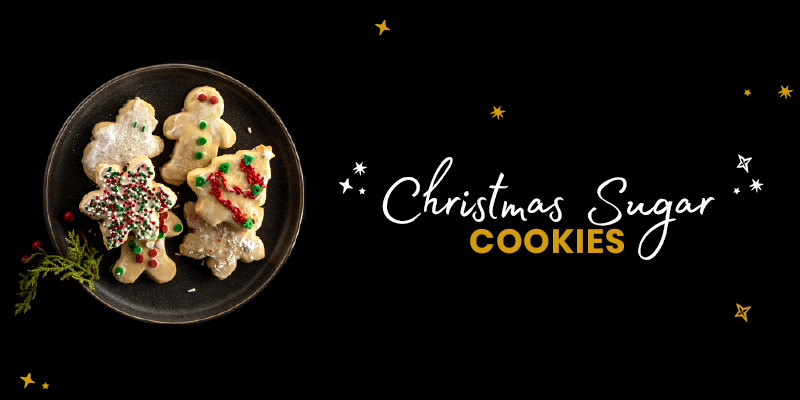 Get everything you need to make our Christmas Sugar Cookies online or in store!